Begin your travel experience in Greece with a private, luxury and hassle-fee transfer from Athens' airport! Whether you’re travelling alone, as a couple, family or group, we've got you covered! Book now your Athens Airport Transfer and begin your trip to Greece in the best -and most convenient- way possible! Our professional driver will ensure a smooth trip to and from Athens International Airport, so you don't have to worry about the details; all you need to worry about is how to have the best time during your stay in Greece! Your flight is monitored for delay - you're in safe hands! Our driver Petros, was waiting at the airport arrival hall with a sign - fast and safe service, thank you very much. In the spirit of offering you high-quality travel experiences focused on your comfort and satisfaction, we also provide you high-standard transfer services to facilitate your stay in Greece. Arrange your Athens airport pickup, and begin your vacations in Greece in comfort and luxury! This service guarantees your someting an Athens airport taxi never will: a safe and on-time transfer in a luxury vehicle with an experienced, professional english-speaking driver. Additionaly, fleet of vehicles, from sedans, minivans to limousines that meet high-safety standards, are at your disposal depending on your mood or budget. Regarding your Athens airport transfer, your professional driver will be waiting for you at the arrivals gate of the Athens Venizelos Airport, in order to welcome you and pick you up. Enjoy a comfortable and safe drive to your Athens hotel or apartment, having eliminated completely all the stress and the hassle of transportation! The driver will be waiting at the arrivals gate, holding up a sign with your name. Do you also arrange port pickups? Of course we do. Let us know when and we'll be there! Are the services provided by a professional driver? All of our drivers are licensed, experienced and English-speaking professionals. You should book with us, because our professional driver will transport you to and from the airport in a hassle free, efficient and fast way, completely eliminating stress from your experience. Additionally, the flight monitoring service is included in the price, leaving no room for missed flights! 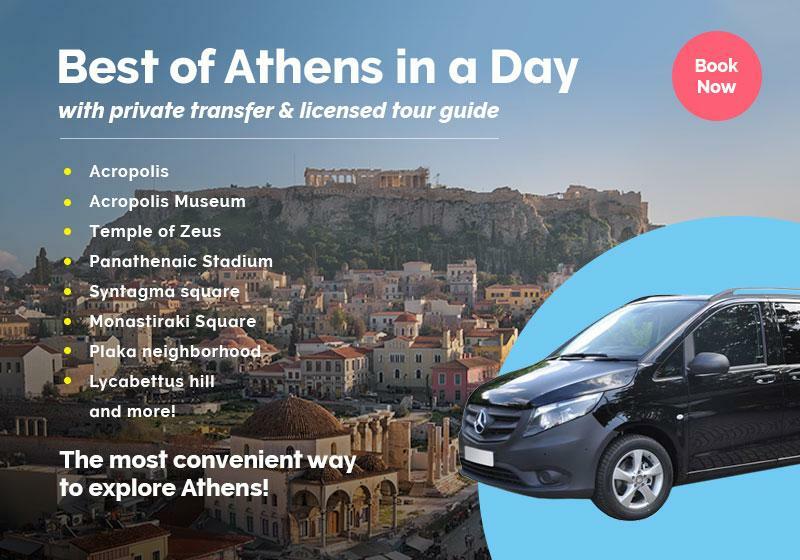 The "Athens Airport Transfers" is available as a private tour, in order to further customize your experience to fulfill your specific needs & expectations. Simply tell us your preferences in the booking form below.